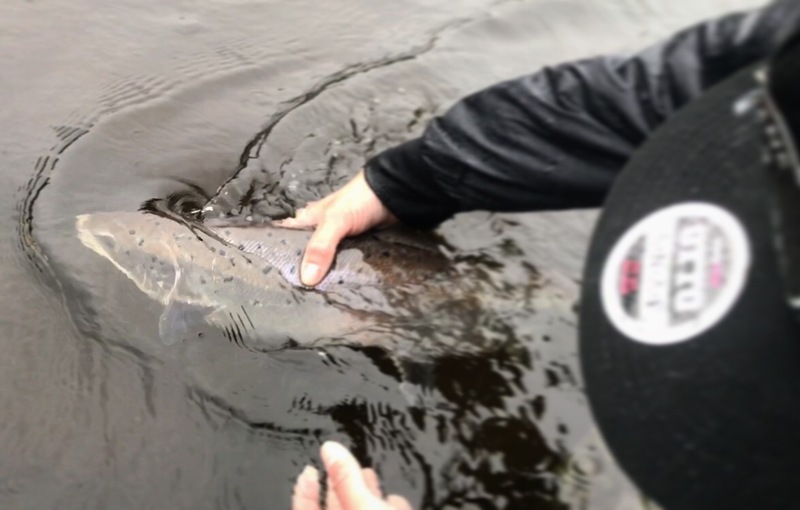 I set the challenge for myself to catch my first Welsh Salmon and Sewin this year! Not an easy quest by anyone’s standards but they’re fish that I find fascinating both for their impressive migrations and their stunning looks. I’ve put quite a bit of time into getting to know some small stretches of a local river and with some helpful guidance and pointers from experienced locals (I am indebted to your kindly shared advice) have been able to get a few trout on the fly under my belt…however it was their silver ocean going relatives that I was really immersed in catching. With a week of torrential rain during June my attention was firmly set on ticking one of these mysterious travellers off my list. In high flood water it was time to get the spinning rod out…rapalas and flying c’s were the order of the day and filled my box in a variety of colours and weights. I put a fair amount of solid effort into my quest, fishing in everything from horizontal rain managing to find its way through every conseivable cuff and zip in my jacket, to warm humid evenings and eery calm before the storm mornings. However it was a still peaceful morning as the river was falling that saw the first of my ambitions hooked, I had woken up early before work joined by a colleague to try our luck at a fresh run Salmon. Rumours had hinted a few had been caught the day previous so hopes were high, despite our efforts nothing had shown in the almost perfect looking water. I was determined though and promised myself I would have a few final casts in a pool that I had a good feeling about before racing off to work…perhaps my confident approach to the pool made the difference, within a few casts my lure swang with the current over a depression I felt a sudden slam before my rod arched over and an iridescent indigo shimmering salmon thrashed on the surface out in the current. Heart in mouth as I played the fish in while in compete awe at its beauty! 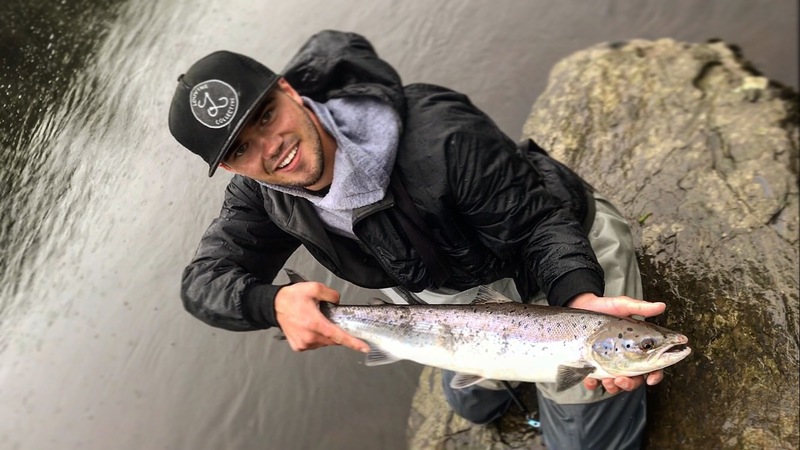 Not the largest salmon the river has ever seen but my first Salmon in Welsh waters and suddenly all the blanks and groussome weather needn’t matter as I gripped the fish by its forked tail and held it up for a photo before allowing it to recover and swim away strong. Onwards to continue its incredible migration and provide stock for years to come. After this fish I felt confident in my approach. People will tell you “you learn more when you blank” to me that’s not quite true. Yes blanking teaches you when not to go, what doesn’t work and on occasions can be pretty humbling, for me though it’s catching after putting in the work and reaping the rewards when you really start to learn. Learn what? Learn what the fish react to, when you should focus your time on that particular species and most importantly where they hold. The areas where that fish and no doubt other fish will be found in future. It’s a process you cannot get to alone without the blanks but to learn and become better success must be repeated. This is something I’ve always been pretty determined to do, not to count sucesss as a fluke, but to repeat it, do it again and if possible better. I missed out on two occasions when the river would have been in perfect condition due to work and other commitments. However once I had the opportunity to get out on the river again I was determined to seek success. I had thought through in my head the areas the fish could be holding, how could I present my lure to them and when would give me the best opportunity of success. An early morning plan was hatched and upon arrival at the pool I had in mind it was only a couple of casts in when I felt a sudden tightening before a fresh silver slab thrashed at the surface followed by a thrilling powerful bolt up and across the pool. After an awesome display of the strength and power of these fish it was landed and a few quick snaps taken before allowing the fish to recover prior to release! 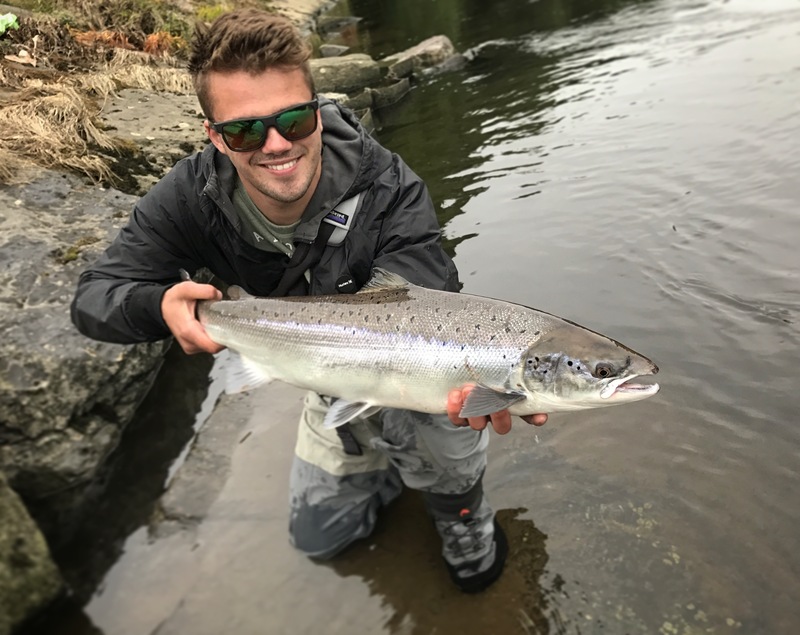 This fish was far superior to the previous, fresh off the tide it could have only been in the river a couple of hours, its tail and underside still caressed by sea lice along with its shimmering lilac tinted latteral line. It was fair to say I was in complete awe at the beauty of the fish and a memory that will stay with me for many years to come. No doubt I will continue to spend plenty of time out bassing over the next few months but I can’t help but suspect that these migrational beauties will have me sidetracked and distracted a little…can you blame me?? Hi Nath, you’ve started well on the salmon mate I have fished once on the rivers and blanked, where were you on the Usk with Mr T.